There are some smells that are universally agreeable: just-cut grass, just-right toast, and of course, freshly-ground coffee. And now, thanks to some superb at-home coffee grinders, you can recapture a little bit of that magic in your very own kitchen, assuming, that is, that you've already bought the very best coffee machine. Why buy a coffee grinder? 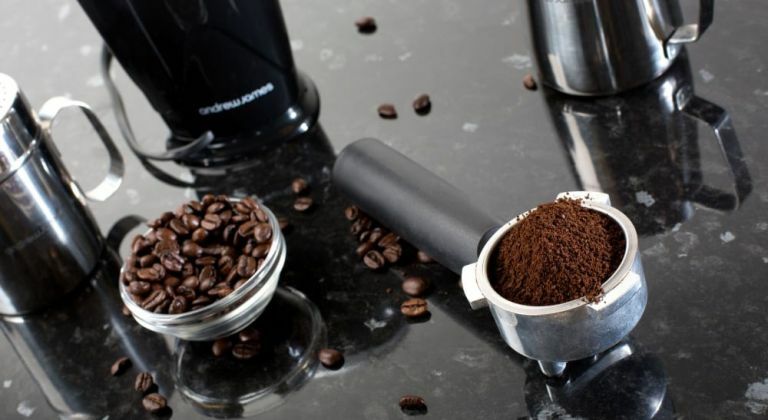 Some bigger coffee machines come with built-in grinders, but if you have a compact model without, or take your brew from a cafetiere or moka pot, a coffee bean grinder is a great investment. As well as filling your kitchen with that fantastic smell, grinding coffee beans at home, to order, means a fresh taste every time, rather than keeping a large amount pre-ground, which will go stale more quickly. For large rounds at dinner parties, or big families who all have a thing for coffee, look for a grinder with a large capacity to fulfil a lot of orders quickly and easily. If you don’t have a lot of worktop space to spare, a smaller one will do the job equally well, just with more refilling. If you are partial to an espresso or ristretto, make sure you pick a grinder with a fine enough grind setting. Finally, when we use the phrase 'coffee grinders', don’t let us restrict you: some grinders are also ideal for using with tough-to-crack spices like cardamom or cloves, or even for nuts to fold into bakes or sprinkle on dishes. Just make sure to clean your machine thoroughly in between, so your coffee doesn’t taste like cumin, and vice versa (unless you’re into that sort of thing). It should come as no surprise that a grinder bearing Blumenthal’s name both looks amazing in the kitchen, and outperforms all comers. There are a phenomenal 60 grind settings, and the removable hopper at the top (for whole bean storage), has a 450g capacity, so you don’t have to re-fill too often. Choose from presets for French press, filter or espresso, or programme your own cup size and shot volumes. Truly one for the connoisseur, the ideal gift for the coffee lover who seemingly has everything else — although for the price, you have to really, really love them. This Krups offering is small, svelte and stylish, so while it’s easily packed away it’s also no bother to keep it on the worktop. It’s supremely easy to use, with just one button that works much like that of a hand blender — just keep an eye on the beans through the clear lid until you have the perfect grind — but will require some trial and error if you’re not sure how fine you’d like your grounds. An affordable coffee mill with uniform grinding and no confusing extraneous bits, it’ll fit seamlessly into any kitchen. Great for spices, nuts, and even houmous or pesto as well as coffee beans, this Andrew James grinder is a thoroughly useful tool for keen chefs, and far easier than a pestle and mortar. Use it for wet or dry ingredients, just make sure that bulkier ingredients are chopped small before grinding. Its stainless steel blades are durable and easy to clean in between prep stages, and its 150W motor is powerful enough to face down some tough ingredients. For under £15, you can’t go wrong, but if you’re a coffee perfectionist, go for something that gives you more control over the grind. While it’s not the cheapest on our list, this De’Longhi model offers first-rate value for money for its performance and ease of use. Making a great cup of coffee is superbly simple: choose the grade you’d like, from fine to coarse, and the number of cups, from two to 12, then press the button for the perfect portion. The removable powder container is also a nice touch which minimises mess. If you want more control than with a budget grinder, but not the hefty price tag of the professional models, this is the perfect buy. Swan’s stainless steel coffee grinder does double duty as appliance and art piece, with its unique design and great functionality, especially for the low price. Its brushed metallic finish looks decidedly high-end, and the integral cup, meaning you can grind straight into your drinking vessel with no messy transfer, is a touch of genius. The push-button is simple to use, and you can pulse to your preferred grind. The only issue is trying to get a fine enough grind on a single pass-through: espresso drinkers will probably prefer the Krups on this front. The clue to this grinder’s appeal is right there in the title: its professional good looks worth of any high-end establishment, and of your morning routine, too. The brushed stainless steel housing is both robust and beautiful, while the grinder itself has dishwasher-safe parts for easy clean-up. The real charm, though, lies in its wealth of options: there are 18 grind modes, and it has the ability to make anywhere between four and 18 cups. If you tend to be a solo sipper who likes fresh coffee, and doesn’t want to make four cups at a time, the Hunt Brothers manual grinder is a good alternative. The Dualit Burr Coffee Grinder is the best grinder for a large yield on our list, with its generous 250g-capacity hopper and convenient dosing selector. The conical burr, generally a good marker of a quality grinder, spins more slowly to minimise clogging and overheating, and the 10 grind settings offer something for all cups. That clever burr is also removable, for easy cleaning.